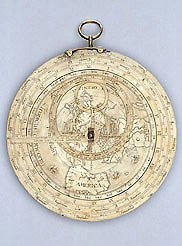 This very elaborate astrolabe has only one plate but is engraved with a map of the world from the Tropic of Capricorn to the north Pole, with a circle of latitudes surrounding the map itself. Among the accessories on the back, and an unusual feature on an astrolabe, is a sundial derived from the Rojas projection, with a trigonus as described by Gemma Frisius in his edition to Apianus' Cosmographia (1584). The sundial enables the user to find, in addition to the time, times of sunrise and sunset and the duration of twilight.